Intersystem’s TrakCare™ software is a Web-based, patient-centric healthcare information system used by leading healthcare organizations around the world. 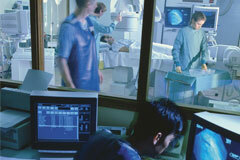 It is comprised of a comprehensive portfolio of application modules, including patient. Healthcare organizations in 25 countries are making breakthroughs in patient care with TrakCare, a unified healthcare information system that enables coordinated care within a hospital or across care settings throughout a region — facilitating a seamless patient journey. Clinicians and administrators use TrakCare to improve safety and outcomes, control costs by eliminating duplicate tests, reduce medication errors, expedite billing, maximize resource utilization, and achieve other strategic initiatives. TrakCare’s comprehensive clinical, administrative, and departmental modules share a single data repository and have a common user interface. Data entered once is immediately available to all authorized care providers, enriching the patient record with each interaction. The EPR within TrakCare is designed to capture the continuum of clinical and administrative information about a patient. The PMI is the cornerstone of the TrakCare system, supporting the patient-centric EPR. TrakCare Clinicals allows authorized healthcare professionals to document care and enter patient data. TrakCare PAS automate workflow within the Inpatient, Outpatient, and Emergency departments. Community provides timely information, better use of resources, and improved communications. It handles the triaging and treatment of patients during emergency attendance. Imagine a World of Seamless Care. Welcome to the World of InterSystems TrakCare. Today, in leading healthcare organizations in 25 countries, InterSystems TrakCare is making care delivery more effective and efficient. Clinicians and administrators are using TrakCare to improve safety and outcomes, control costs by eliminating duplicate tests and other redundancies, expedite billing, and maximize resource utilization. TrakCare is a world-class healthcare information system with clinical, administrative, departmental, and add-on modules that are unified by a single database and a common user interface across all platforms. TrakCare automatically detects the type of device in use to optimize specific functionality, such as touch on a tablet or smartphone, for a more seamless, more efficient user experience. working with TrakCare means less time spent searching for information, and more time spent with patients. Clinicians can work with complete patient records at any point of care, on any Internet-connected device. Smart design provides a better experience for clinicians. For example, the ability to manage and document clinical encounters from a single screen within a “problem-oriented context” guides faster, better decisions. TrakCare automatically detects the type of device in use to optimize specific functionality, such as touch on a tablet or smartphone, for a more seamless and efficient user experience. TrakCare offers a unique combination of advanced technology and our ARIES rapid implementation methodology for successful deployments. Since TrakCare is Internet-based, it provides the hardware cost benefits of a thin client while minimizing the IT and administrative overhead associated with software upgrades in a traditional client/server environment. Partnering with InterSystems eases the task of interfacing and interoperating with devices and other systems. The NHS Scotland Patient Management System program for hospitals gives authorized users immediate access to better clinical and administration information from one standard healthcare information system. It is a strategic part of the Scottish Government’s e-health transformation to empower a 21st century Scottish NHS to provide effective, fair, and affordable care.